This well-priced product will sound better than your HDTV’s built-in speakers, but it's certainly not a high-end system. When it comes to the world of music, there’s arguably no company more intimately involved in so many aspects as Yamaha. The company produces musical instruments, hardware for commercial and home recording studios, and products for the consumer home theater. Few manufacturers can match its depth and breadth when it comes to sound, and they have something for every budget. Yamaha’s $600 YHT-5920UBL Home Theater in a Box (HTIB) is an entry-level system for people on a budget who want basic surround sound and the latest network-streaming features. 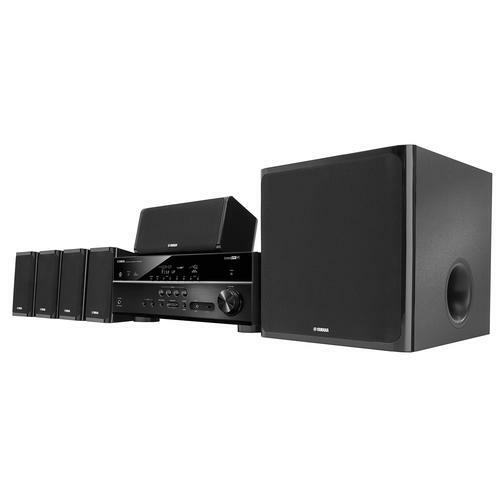 It’s a 5.1-channel system with five satellite speakers, a powered subwoofer, Yamaha’s RX-V479 A/V receiver (available separately for $399), and the wires needed to connect everything. The satellite speakers are small, black plastic cabinets housing 2.75-inch full-range cone drivers. They’ll fit discreetly into most home décor. I’d describe them as utilitarian, not audiophile grade. The subwoofer consists of a 100-watt amplifier driving a 6.5-inch cone. By subwoofer standards, it’s a light 17.6 pounds. Yamaha’s RX-V470 AV receiver is the star of this show. Its amplifier is no powerhouse, being rated at just 80 watts per channel with two channels driven, but the receiver delivers more features than you might expect for its price tag: Wi-Fi, Wireless Direct, and ethernet. Apple AirPlay support will enable you stream from any iOS device and Bluetooth support will handle anything else. Yamaha’s YHT-5920UBL HTIB features MusicCast, the company's multi-room audio technology that competes with the likes of Sonos. AirPlay is Apple’s solution for multi-room audio, but the RX-V470 also supports MusicCast, which is Yamaha’s own multi-room solution. You can read more about MusicCast here. Spotify and Pandora music-streaming services are built in. The receiver can decode just about any audio codec, including high-resolution FLAC and ALAC files and even DSD audio. In other words, if you have a digital music file, you can be confident that the Yamaha will play it. There are six HDMI inputs, but only one HDMI output; you’ll need an HDMI matrix if you want to connect both a TV and a video projector to this receiver. You’ll also want to know that only one input is certified for 4K UHD content with HDCP 2.2 copy protection (its one HDMI output also supports those standards). There are two coaxial and one optical digital-audio inputs; three RCA stereo inputs; four composite video inputs; and a composite monitor out. In other words, there isn’t a lot of support for legacy hardware—but how many of us are still holding onto much of that stuff these days? Yamaha's receiver has fewer legacy inputs and outputs than Onkyo's, but it covers most of the basics (and it's much more comprehensive than the Denon receiver in the Orb bundle). The Yamaha HTIB was easy to set up. In addition to the included manuals, Yamaha makes available an iOS and Android tablet app called AV Setup Guide that will take you through setting up your system and making the right connections with detailed illustrations. If you’re intimidated by connecting equipment to your wireless network, don’t be; the Yamaha makes it easy. And if you’re an Apple iOS user, it’s a piece of cake. Just follow the on-screen prompts and the Yamaha will instantly copy the network settings from your iOS device. At the click of a button, you’re done and your entire system is online. This microphone and software built into Yamaha's receiver can help compensate for a room's poor acoustics. The most difficult part for novice users will be stripping the insulation from the speaker wires. 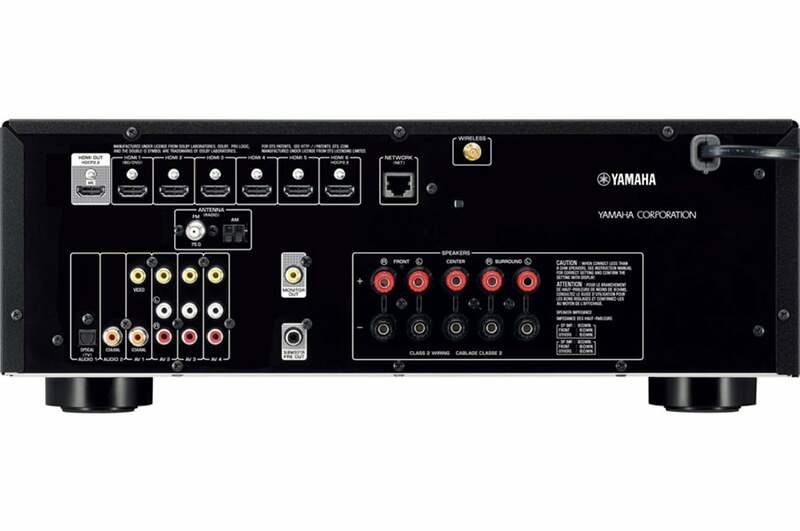 The Yamaha receiver comes with a basic version of the company’s YPAO (Yamaha Parametric Acoustic Optimizer) for automated speaker setup. Don’t be confused by the name. You still need to place your speakers properly, but YPAO will help compensate for acoustic anomalies in your room. Just hold the included microphone at ear level and let YPAO do its magic. It wouldn’t have been fair of me to expect audiophile-class performance from a $600 home-theater setup, but I did anticipate something better than what the typical HDTV could put out—and that’s exactly what I got. The speakers imaged well while playing the Star Wars: The Force Awakens soundtrack in 2.1-channel stereo; however, the music suffered from significant coloration. Instruments didn’t sound completely natural. John Williams’ score makes ample use of brass and strings, and the brass instruments were completely robbed of their sparkling top end, while the strings lacked warmth and finesse. Familiar singers I listened to didn’t sound completely right either; things were just off. Listening to various tracks by U2 and Loreena McKenitt, for example, some of the distinctive textures of both Bono’s and McKenitt’s voices came across blurred, for lack of a better term. There was a persistent boxiness to the sound, too, which was I think was exacerbated by a palatable lack of dynamic range. Was all this better than typical TV sound? Sure. But it didn’t excite me. Yamaha’s speakers are small and the satellite cabinets are made of plastic. Spinning up Mad Max: Fury Road on Blu-ray provided a superb test to see how the Yamaha system could handle surround sound. The Yamaha does a decent job at its price point. If you’re looking for enveloping sound with some thumping bass, the YHT-5920UBL has you covered. 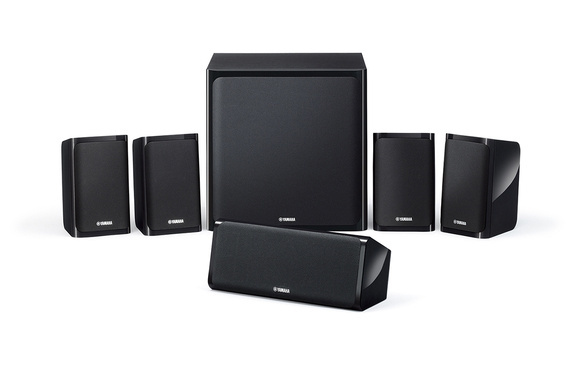 It delivers a very good, but basic surround sound presentation that no TV can match. If you’re looking for anything more than that, Yamaha won’t fully meet your expectations with this system. Mad Max: Fury Road has a superb surround mix, but I thought Yamaha’s surrounds were a bit too aggressive. 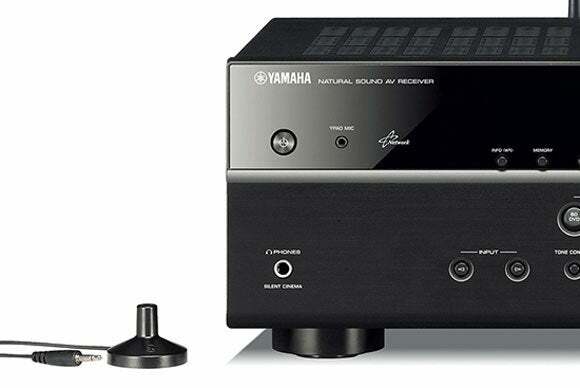 But if you like to hear sounds coming at you from all angles—even if that presentation isn’t necessarily accurate—then the Yamaha will suit you just fine. In the opening scene, Max, played by Tom Hardy, tries to flee his pursuers. Cars roar from all around. Having watched this movie in the theaters as well as on several high-end and budget audio systems, I knew that the Yamaha’s presentation crushed fine audible details. For example, when Max is captured, his captors try to brand him with a hot iron bearing the fiendish Immortan’s flaming seal. The audible sizzle of individual sparks jumping from the hot iron bled together into a single sound. 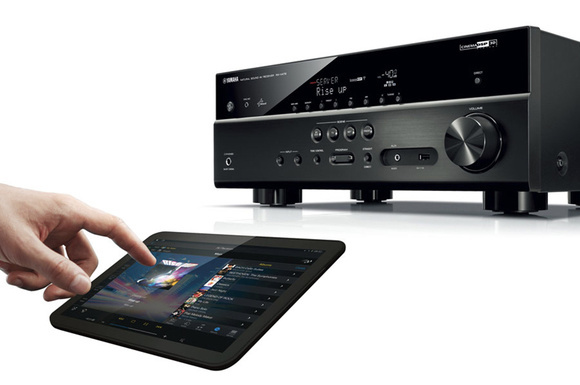 The antenna sticking on the back of Yamaha's receiver enables you to connect it to your Wi-Fi network. Voices weren’t spot on with Blu-ray, either. Charlize Theron, who plays Furiosa, didn’t sound like herself; the same was true for the voices of the other actors. Dynamics were somewhat crushed as well, and it was noticeable on bombastic scenes, such as when Immortan’s crazed caravan pursues Furiosa and Max with a literal rock-opera entourage. Notes and cues that were clearly audible on more-expensive systems just weren’t discernible here. In fact, I found myself wanting to crank up the volume just to hear things more clearly. At one point during one of my weekend listening sessions, my wife asked me why I was playing the system so loudly. Switching to the Onkyo HT-S7700 or Orb Audio’s Complete HTIB setup was no contest. Those other systems articulated much more detail and presented a greater sense of space—albeit at the cost of hundreds more out of your pocket. Having said all that, the chase and action scenes were fun, with well-presented low-frequency effects. If you’re looking for boom boom in your movies, you’ll be happy with the Yamaha. This Yamaha HTIB offering’s true strength is its price point and feature set. 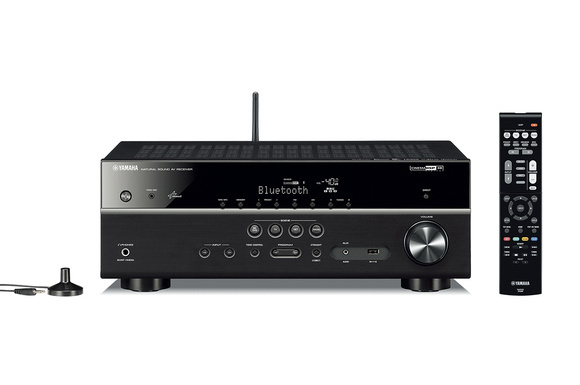 If you’re on a tight budget, love music streaming, and want surround sound that’s better than your TV’s built-in speakers, then the Yamaha will do you well. If you’re serious about exacting audio reproduction, this system won’t be your cup of tea.